Notting Hill is best known today for its annual carnival, the trendy Portobello Road market, and the 1999 Hugh Grant and Julia Roberts romantic comedy that borrows its name. It's an area synonymous with trendiness and wealth; the place to be seen and to be from. But in the inter-war years Notting Hill was utterly different: a poor, crowded working-class district set in the shadows of the aristocratic mansions of Kensington. It was just the sort of socio-economic setting, however, to produce quality boxers. It produced an abundance of them during 1920s and '30s, with at least 79 pro fighters representing the district within that 20-year period. By contrast, in the three decades after World War 2 (1945-75) only eight pro boxers fought out of Notting Hill. Hardship really does develop hard fighting men. And there were few harder than George Davis, who was born in Notting Hill's Crescent Street in July 1918. One of 15 brothers and sisters, he was a nephew of the one-time British and world bantamweight champion Digger Stanley. 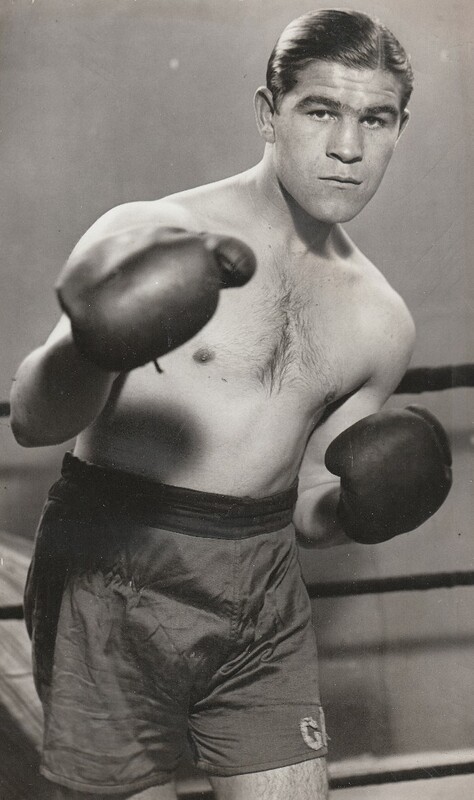 Like most '20s schoolboys of the area, George's idol was the Anglo-Italian Notting Hill fighter Alf Mancini: one of the best men, at any weight, never to win a British title. Davis, along with many other west London lads, lingered outside of fight halls wherever Mancini boxed, eager to get a glimpse of his hero and find out how he had fared that night. Despite his passion for boxing, George initially excelled at another sport, cricket. As a schoolboy he played for London against public schools at Lord's and other notable grounds, and earned a reputation as a fast bowler. His team mates, interestingly enough, included Denis Compton, who was later famous as a Middlesex cricketer and Arsenal footballer. Boxing, though, was to be George's greatest talent, as he proved when he captured the 9 stone 7 lb junior title at the Working Boys' Federation Championships, at the Royal Albert Hall, at age 15. In those days, for working-class lads, providing for the family overruled any amateur sporting ambitions, and accordingly George was still just 15 when he had his first paid bout, in March 1934. Initially fighting at around 10 stone, he soon established himself as a star attraction in local arenas. The crowds instantly took to his aggressive style, which was complimented by a sound boxing brain and a fearsome punch. At age 17 George caused a string of upsets when he outpointed the clever veteran Billy Bird of Chelsea, stopped the brilliant George Rose of Bristol inside two rounds, beat the highly regarded Buster Osborne in the latter's Bethnal Green back yard, and outmanoeuvred the experienced Dixie Cullen of Chelsea. His manager, Jack King, wasted no time in pitting George against the toughest welters and middleweights in the country, and he often fought three or four times a month. Most of his matches were in London districts such as Hammersmith, Shepherd's Bush, Paddington, Earl's Court and Kilburn: all within walking distance of George's home. As the victories piled up, so Davis's reputation grew; but there was one man who proved a perpetual bugbear for the Notting Hill youngster. Jack Lewis of Bournemouth beat Davis once in 1935, four times in 1936, then for a sixth time in January 1937. Davis, however, eventually got his revenge with a 12-round points win over Lewis at Finchley football ground in July '37. Three weeks after his victory over Lewis, Davis was in Bournemouth to take on an up-and-coming local star named Freddie Mills. After dropping Mills in the second round with a splendid body punch, Davis put the future world light-heavyweight champion down in the tenth and final round with a blow that may have been low. As Mills writhed in agony on the canvas, his seconds appealed for a foul; but referee Billy Swift ignored their pleas and counted Mills out. The result was unsatisfactory, so a rematch was ordered for 20 October. Again George Davis got the better of Mills, this time with a 12-round points win. The months that followed saw Davis's stock rise considerably, as he outpointed the gifted Norwich craftsman Arthur 'Ginger' Sadd, KO'd Charlie Parkin, outboxed the rugged Glen Moody and twice stopped former British welterweight champion Dave McCleave. The pinnacle of Davis's career arrived in October 1938, when he outpointed Stepney's Jack Hyams, a first-rate boxer who'd given Jock McAvoy a tough test, to win the Southern Area middleweight title. Davis defended the title once, with a points win over George Howard in August 1940, but three fights later would be forced to hang up his gloves for good. With the Second World War in full swing, Davis was called up to serve, and boxing of course was part of military training. An army boxing instructor made the mistake of thinking he knew more than Davis and challenged the young man to a session in the ring. Davis, never one to hold back or resist a challenge, handed the instructor a devastating beating. Whether the man had realised who George Davis was or just how good he was is unclear. At any rate, the instructor, enraged by the humiliation he'd suffered, cornered George some hours later. He produced a gun and fired at the Southern Area champion's arm, wounding him so severely that he was pensioned out of the army. Sadly George never boxed again. He was aged just 22 at the time of his final contest, a points defeat to the South African Eddie Maguire in April 1941. Although Davis had already taken part in 117 recorded pro bouts (75 wins, 34 losses and eight draws), one assumes that his best fighting days had yet to come. With the tremendous Jock McAvoy reaching the end of his glorious career, the 1940s lacked a dominant British middleweight champion. Were it not for a reckless army sparring session and a moment of madness from a humiliated boxing instructor, perhaps George Davis would have got a crack at the title. Around 1938-45 he also used to be part of the entertainment when travelling fairs with as boxing theme came to town, a person said in colville square gardens or one of the small garden areas mid-houses in the area, the fairs would collect in lots of items like bakery waste (left over buns, bread, cakes and confectionery) and boxers would do head-to-head timed challenges to punch through whatever they could in 1minute or 2 minutes etc. the boxers earned extra money for who won, the public were entertained and all the food waste went to the animals as feed or collected in for farming as pig feed that the boxers had punched. A guy now in his 90s says he as about a 10year old in west london recalls seeing Mr Davis doing the challenges 2 or 3 times in his childhood over several summers when the fairs with boxing were in town. he recalls asking about Georges boxing gloves they used for the food-punching and they were made like a boxing gloves but from all off-cuts as stitched together leather to make a full glove as it was to use up waste offcut leather for gloves that would be thrown out after anyway rather than best ones. these inferior gloves earned the boxer an extra penny -as the glovemakers guild -i think now part of leather sellers hall (the worshipful company of leather sellers)in the city of london as a guild or trade livery company back then paid the penny to "appease the boxer with talent been put in a inferior glove" as a compensation for the food-fighter events. Thanks Efy. It's nice to know the piece has been read by a relation of George Davis's.